Harry Kazzam started entertaining after joining two 'hobbies'(a childhood love of magic and working voluntarily with children) enabling him to work following major spinal surgery. Having put them together, Harry realised that he could have a 'job' that he thoroughly enjoyed (and was reasonably good at!). Within just two months of starting out on this path he was able to go full time, and has never looked back. 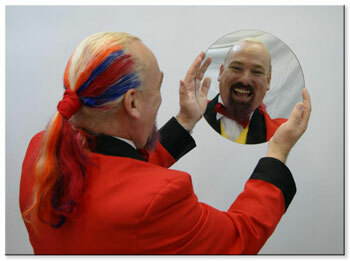 Harry Kazzam quickly became recognised as one of the top children's entertainers in Cornwall (NOW AVAILABLE IN HAMPSHIRE & DORSET), once making in excess of 500 appearances at The Flambards Experience in Helston as their resident magician over a four year period. He is kept very busy with Birthday Parties and his clients include Cornwall County Council, The National Trust, Police and Fire Services, various Military Services, Schools, Nurseries and summer holiday camps. 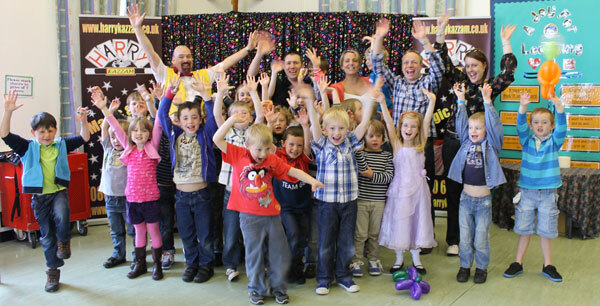 Harry's magic & fun show encourages audience participation, is very visual and suitable for children of all ages. Harry firmly believes that there is no age limit on being a child - adults enjoy the show too! Harry's 'glamorous assistant' is an ostrich named Gloria who also joins the fun. Children are put at ease and love to participate throughout the show helping to achieve the magic. © Harry Kazzam Entertainer 2018. All rights reserved.